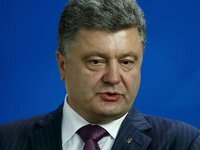 Ukraine's strategic goal is to apply for EU membership and receive an Action Plan for NATO membership no later than 2023, President of Ukraine Petro Poroshenko said. "I set a strategic goal for myself and the whole state: to apply for membership in the European Union and get an Action Plan for NATO membership no later than 2023," Poroshenko said at the youth forum titled "Youth opinion is important. Prospects for joining NATO and the EU" in Pereyaslav-Khmelnytsky of Kyiv region on Monday. He stressed that this is not about formal gestures, but about such a degree of partnership and interaction when Ukraine's ambitions get a chance to be realized. "It is not easy to achieve this, but it is necessary, and it means that it is possible. Ukraine has never been so close to the European Union as it is today," the president stressed. According to Poroshenko, Ukraine today is the freest country among all former Soviet republics, with the highest level of democracy and freedom, while "in neighboring Russia you can get a criminal sentence only for the "wrong" like in Facebook." The head of state noted that young people were lucky to be born and grow up in a free democratic country, "where you don't have to constantly act cautiously and carefully consider your own words and even thoughts."